In the countdown to the London Marathon, the adidas running team worked with adidas elite athletes, puddles and some social media personalities to get everybody talking about why our capital makes for such glorious running using #WHYIRUNLDN. For our first piece of London Marathon content, we wanted to capture the iconic landmarks of the capital with an adidas twist. 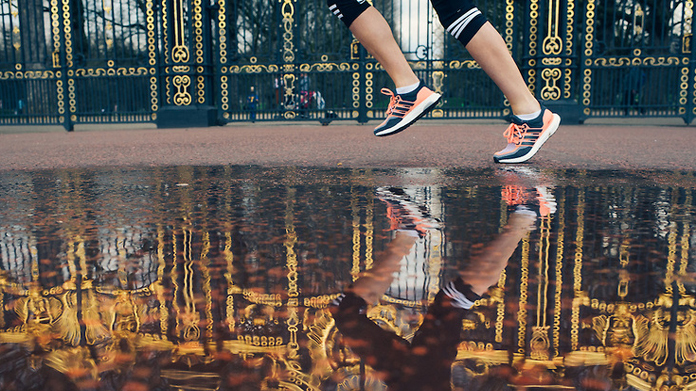 Working alongside the Mikael Buck and the London adidas Newsroom we created a series of reflection images, allowing us to capture adidas shoes and London landmarks together in one striking shot. These were used across adidas social feeds, and to date the results have been fantastic, seeing some of the highest rates of engagement in the year so far. An image shared on the @adidas global Instagram channel resulted in over 103,000 likes. The second string to our London Marathon bow saw the team work with four Instagram personalities to share their stories on why they love to run in London. Gus Nwanya-Aliyu (@theboygenuiz) and the team had a blast capturing beautiful imagery of Kim Hartwell, Adrienne Herbert, Bradley Simmonds and Josh Newis-Smith running their favourite London routes: The Mall, Holland Park, The Southbank and Battersea Park. The content was shared across their Instagram channels and on @adidasuk social. The images once again flew, and engagement rate across the seventeen posts was superb. The final part of our London Marathon campaign saw the team host two final training runs for media taking part in the 2016 race. One with expert collective Advent Running and the other with adidas elite athletes Wilson Kipsang and Mary Keitani, Wilson being a previous world-record holder and double London Marathon winner. The attendees were able to pick up trade secrets to improve their times on the big day, not to mention an indulgent recuperation session at the Corinthia Hotel spa. The runs resulted in coverage in Daily Star, on Closer Online, InStyle Online and Sportsister. Though our Hope&Glory runners may have been unable to replicate the elite performance of Wilson Kipsang on the road, we certainly achieved some great PR results to match. The #WHYIRUNLDN hashtag was used 600 times over the course of the week. A winning result! Line up, London. Today we run this city.